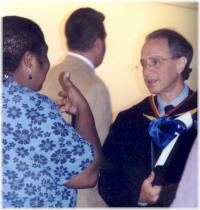 In September of 2002 Dr. Ray Kurzweil received an honorary degree from Landmark College of Putney, Vermont. Landmark College is a college that focuses on students with special learning needs. You may know Kurzweil as the inventor who has often said, “it is possible” when others have said it is not. An example of this pioneering spirit took place the mid 1980’s when he invented the first electronic keyboard that sounded as good as a piano. That being the case, why did he receive a degree from a college and not a conservatory? Dr. Kurzweil and Landmark College have a special research and development relationship. Landmark students use optical scanning text-to-speech software programs that were developed by his company. These programs help the students with writing and reading assignments. Kurzweil developed this technology in the mid 1970’s, one of the first to do so. During the college’s convocation Kurzweil spoke to students about his inventive process and visions of the future. He said college is a place where people of with learning differences and different passions come together with a common passion to create knowledge. The study of the future and inventing is currently his main focus, he said speaking on his passion. Thomas Edison is his archetype. He mentioned that Edison never listened to the discouraging words of his 3rd grade teacher who told him he (Edison) would go nowhere in life. Speaking on inventors, Kurzweil said, “an invention makes sense to an inventor when the invention is completed. Even if the invention may make sense to the inventor, this does not mean the timing is correct.” An inventor must “catch the wave at the right time.” He said the rate of progress is not fixed, but is accelerating, making inventing an even more time conscious process. Sharing on how his creative process works, Kurzweil said he thinks of a problem to solve (and not just try to solve) before he goes to sleep. He asks himself “what do I know about the ideas to solve?” During the subconscious dream state, social and professional taboos do not inhibit out of the box thinking he shared. When he awakes, he is ready to solve the problem. Kurzweil compared the exponential growth in human knowledge and technology to the explosion of DNA varieties during the Cambrian Explosion. He stated that the first stage of technology took 10,000 years to get to the printing press. The second stage of technology took only 100’s of years to go from printing press to the internet. Another example he gave is the fact that most of the progress made on the human genome study took place in the last 8 months of the first five-year segment of the project. By the year 2020, computers will be as fast as humans. 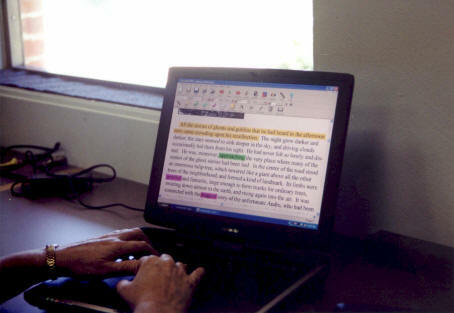 People will commonly wear small computers equipped with retina scanner displays (computer displays that can be worn as glasses, that project an image onto the eye’s retina). There will be a neurological flow of people’s emotions to the internet. He sited current improvements in brain scanning technology. Kurzweil shared about an occasion where he spoke at two conferences at the same time. How did he do that? At one conference he appeared in person and at the other via a hologram projection system. The hologram of Kurzweil at the remote site was so real looking that one audience member, thanked him for coming so far to speak. The story received a good laugh from the audience at Landmark College, but how could they also be sure he was really there, in front of them, this time? Kurzweil ended by sharing the thought that knowledge, experience, and relationships are all important aspects of a good education and life. Hopefully human relationships of the future won’t be only of the holographic kind, maybe just holographically enhanced!? Click here to view Ray Kurzweil’s US Patent Number 6052663 (PDF format). For more about Landmark College visit www.landmarkcollege.org. See US5875428 for more on Kurzweil reading inventions.